As Atlanta preps for a massive snow and ice storm, I can't stop thinking about spring. My fridge is stocked, my pantry is filled, and all electronics charged. We are ready to ride out this storm. In the meantime, I thought I'd share with you a new favorite product. I know I may be behind the times a bit with this eyeshadow base but I was super duper loyal to my Mac Eye Paints for more years than I care to count. 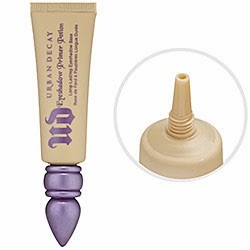 When it was time to purchase a new tube, my Mom and I were shopping and she talked me into this eyeshadow primer by Urban Decay. Since I LOVE Urban Decay shadows and liners, I thought why not. Plus, an endorsement from my mom goes a long way! It comes in a variety of colors but I chose Eden to give a nice neutral foundation for my shadows. A little bit of this primer goes a long way and at 20 bucks a tube, I see it lasting a long time. It's creamy to the touch and dries to a nice matte finish. Following with shadows is a snap. Shadows go on smoothly and evenly with no unintentional smudging. I use this shadow palette and this eyeliner to top off the look. If you're in the market for a new shadow primer, I think you'll love this one. Give it a try and let me know your thoughts! Already use it? How much do you love it? Have a great Wednesday, dolls and please, stay warm out there! This used to be my absolutely favorite primer. I eventually had to make a switch (as is typical with most make-up), but when I was using it, I adored it! Maybe it's been long enough to where I can try it again! I use it and it's my favorite! It works every time, even through sweat and rain and whatever else can take your makeup off. Good pick!